CAKE LAYERS: Preheat oven to 350°F. 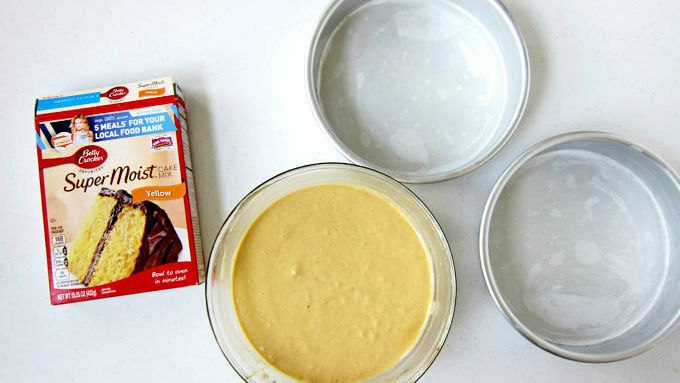 Spray two 8-inch round cake pans with baking spray, then line bottoms of pans with rounds of parchment paper. Make cake mix according to package instructions. Stir in the cinnamon and equally divide batter between cake pans. Bake for 28-34 minutes until a toothpick inserted in the center comes out clean. Remove from oven and let cool in pan for 10 minutes, then un-mold onto a cooling rack and allow to cool completely. 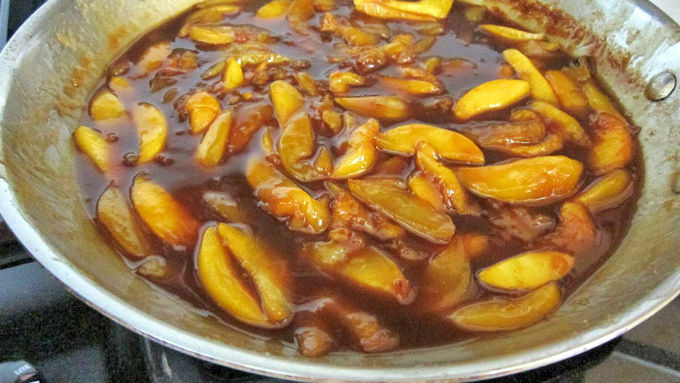 GLAZED PEACHES: Heat butter in a skillet set over medium-high heat. Once melted, stir in both sugars and allow to dissolve. Toss in peach slices, cinnamon and nutmeg. Bring to a boil, then reduce heat to medium-low and cook until peaches are tender, 10-16 minutes. Remove from heat and allow to cool completely. CHEESECAKE FILLING: Beat cream cheese using an electric mixer or food processor until light and fluffy. Add sugar and marshmallow fluff and beat until well incorporated. Beat in whipped topping just until combined. 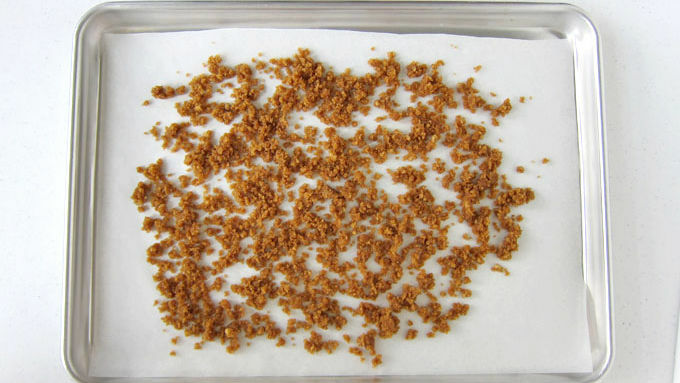 BROWN SUGAR CAKE CRUMBLES: Preheat oven to 350°F. Cut off the domed portion of each cake and crumble the tops into very small pieces. Measure out 3/4 cup crumbs and mix with brown sugar, cinnamon and melted butter. Spread out into a thin layer on a baking sheet. Bake for 10 minutes, then remove and stir. Bake an additional 6-10 minutes until fragrant and deep golden brown. Remove and allow to cool completely. To assemble cake: Cut each cake into 2 even layers. Set one layer on a cake plate. Spread 1/4th of the cheesecake filling over top. Spoon 1/4 of the glazed peaches on top. Sprinkle on 1/4 of the brown sugar cake crumbles over the peaches. 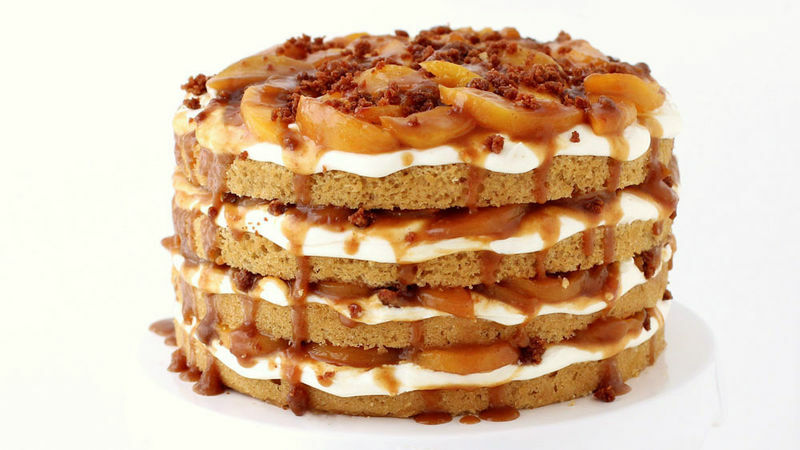 Repeat this process, adding the remaining 3 cake layers and topping them with cheesecake filling, peaches, and cake crumbles. Refrigerate until ready to serve. Will keep in the refrigerator up to 5 days. Go ahead, do a double-take. Want an over-the-top way to make peach cobbler that won’t take you all day to decorate? This four-layer, cinnamon-infused yellow cake topped with cheesecake filling, caramelized peaches and brown sugar cake crumbles couldn’t be more amazing. This dessert combines peach cobbler together with cheesecake in the most striking way. 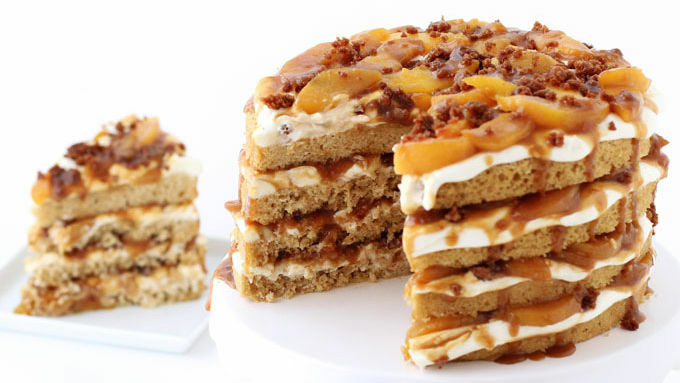 The cakes are left “naked” (not frosted) so you can see all those sweet peaches and gooey caramel sauce dripping down over layers of cake and cheesecake filling. You will make this once, then won’t be able to resist making it again and again and again. It’s that good. So go grab some peaches and a Betty Crocker™ Yellow Cake Mix and get baking. Keep the leftovers (if you have any) in the refrigerator for up to four days.